We ended up departing Kanger just after 10:30 this morning and flew towards Crawford Point, the 6th site on our field campaign. The weather report was that there were low, thick clouds at Crawford, but the forecast called for clearing around noon as a cold front moved through. As we approached the site, it was obvious that the clouds had not yet moved out. The pilots circled ~30 km to the west to look for a hole in the clouds. They found one, and we quickly descended towards the ice-sheet surface. We were watching our GPS and were surprised that we were going for a landing when we were still 25 km away from the site – were they really going to taxi that far? We were more surprised when we settled in and maintained an altitude about 10 m off the deck. We flew this way for 10 km, and suddenly the clouds closed in and we could no longer clearly make out the surface of the ice. At that moment, the Twin Otter’s turboprops roared and we felt the plane quickly gain altitude. Once the pilots lost sight of the ground they could no longer safely put the plane down. So, we flew away from Crawford, work there undone, and set a new course for Summit Camp. We arrived at Summit at ~2:30. The pilots discussed with us the option of continuing to EastGRIP to do our work there this afternoon and evening, but 3 hours of flying and 5 hours of work would have had us back in bed at some unreasonable hour here, so we opted to stick with our original plan B, which was to work at Summit. We went into the “Big House”, the main building at Summit, and met many of the staff and sat through a Summit-camp orientation. We were assigned our sleeping quarters – we all had the option of a new, indoor bunkhouse to stay in, but all of us opted for the tents that were available. Perhaps we will regret that if it gets down to -40 tonight, but we are all excited to have a little personal space. Finally, around 4:15 we were ready to get to work. The science plan here is to drill a 16-meter firn core, log (measure properties of) that core, install a new instrument in the new borehole, measure density in a snow pit, survey the depth of the last year’s snowfall, and measure the permeability of the firn. 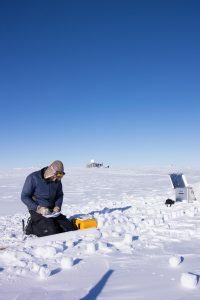 Since we were not starting until 4:15, we figured that we could get started drilling and logging and do the snow pit and depth survey, and stop once it was getting late. Just as we were preparing to drill, we received word that the winds had switched so that they were out of the north – bad news for operations. South of Summit Camp is the “clean-air sector”, where some experiments are set up that require the air to be clear of any non-natural gasses or particulates. When the winds are out of the north, pollution produced by Summit Camp blows into the clean-air sector, and all non-necessary operations shut down. That is, no snowmobiles driving around, no grooming the runway, etc. 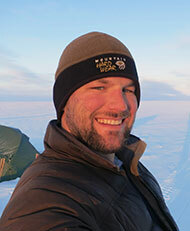 For us, the north winds meant that we could not operate our motor head for our coring drill. The alternate option is turning the drill by hand via a t-handle that attaches to the top of the drill. We decided that the hand drilling sounded rather difficult, but that we would give it a try and see how it went. It turns out that it went well! We started drilling a bit before 5:00, and by 7:15 we had drilled 16 meters. Woah! That is actually just as fast, or faster, than it usually goes with the motor. Mike and Baptiste did the drilling, and Liam logged the core as it came out of the hole. Aleah skied around to survey the snow depth, and I did the snow pit measurements. So, in just 2.5 hours, we accomplished nearly all of the work that we need to complete at Summit! Needless to say, we were a bit proud of ourselves. We came inside and enjoyed the delicious food that is served at Summit camp and discussed whether we more grateful being in a camp with (a) really good food made for us or (b) internet access. The consensus was (a). Baptiste brought a nice Aquavit, so we are closing out our big day with a celebratory nightcap. Tomorrow: ScienceStock Day 2! 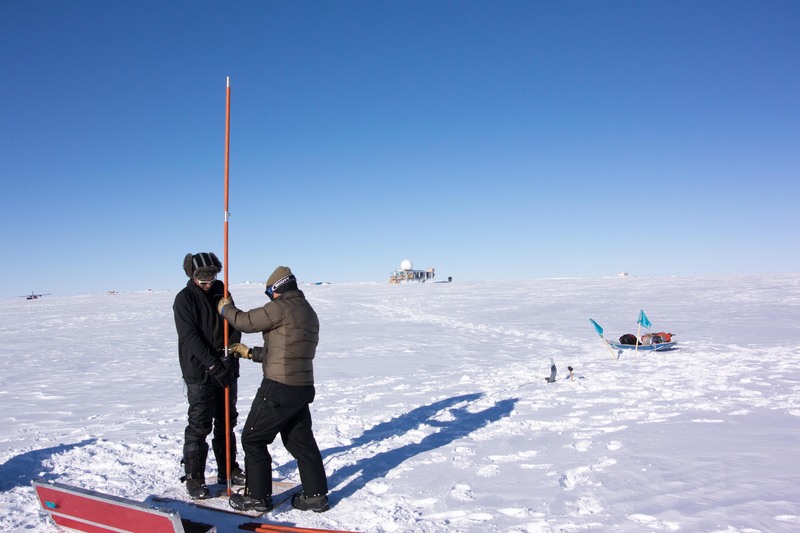 We head north to EastGRIP, where the Danes are preparing to drill a new deep ice core. We will work for a few hours with the same science plan as for Summit – and, we are planning on drilling by hand. Mike and Baptiste drilling the firn core at Summit Camp – the Big House is in the background. Liam hard at work logging the Summit firn core.